Mechanics modeling of spot welds under general loading conditions and applications to fatigue life predictions; Resistance spot weld failure mode and weld performance for aluminium alloys; Resistance spot weld performance and weld failure modes for dual phase and TRIP steels; Fatigue behavior of spot welded joints in steel sheets; Non-destructive evaluation of spot weld quality; Solid state joining - fundamentals of friction stir welding; Failure mechanisms in friction stir welds; Microstructure characteristics and mechanical properties of the magnesium and aluminium alloy laser weld bonded joint; Fatigue in laser welds; Weld metal ductility and its influence on formability of tailor welded blanks; Joining of lightweight materials using reactive nanofoils. Many new, or relatively new, welding processes such as friction stir welding, resistance spot welding and laser welding are being increasingly adopted to replace or improve on traditional welding techniques. Before advanced welding techniques are employed, their potential failure mechanisms should be well understood and their suitability for welding particular metals and alloys in different situations should be assessed. Failure mechanisms of advanced welding processes provides a critical analysis of advanced welding techniques and their potential failure mechanisms. The book contains chapters on the following topics: Mechanics modelling of spot welds under general loading conditions and applications to fatigue life predictions, Resistance spot weld failure mode and weld performance for aluminium alloys, dual phase steels and TRIP steels, Fatigue behaviour of spot welded joints in steel sheets, Non-destructive evaluation of spot weld quality, Solid state joining - fundamentals of friction stir welding, Failure mechanisms in friction stir welds, Microstructure characteristics and mechanical properties of laser weld bonding of magnesium alloy to aluminium alloy, Fatigue in laser welds, Weld metal ductility and its influence on formability of tailor welded blanks, Joining of lightweight materials using reactive nanofoils, and Fatigue life prediction and improvements for MIG welded advanced high strength steel weldments. 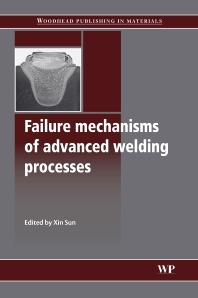 With its distinguished editor and international team of contributors, Failure mechanisms of advanced welding processes is a standard reference text for anyone working in welding and the automotive, shipbuilding, oil and gas and other metal fabrication industries who use modern and advanced welding processes. Dr Xin Sun is a Computational Scientist and Laboratory Fellow at Pacific Northwest National Laboratory, USA.